In honor of the Mythopoeic Society's 50th Anniversary we created these heavy canvas tote bags. They feature our triskelion logo in green, green handles, and a small pocket on the front. They are 20" wide, 13.5" tall, 7" deep gusset at bottom; handles provide a 12" drop. 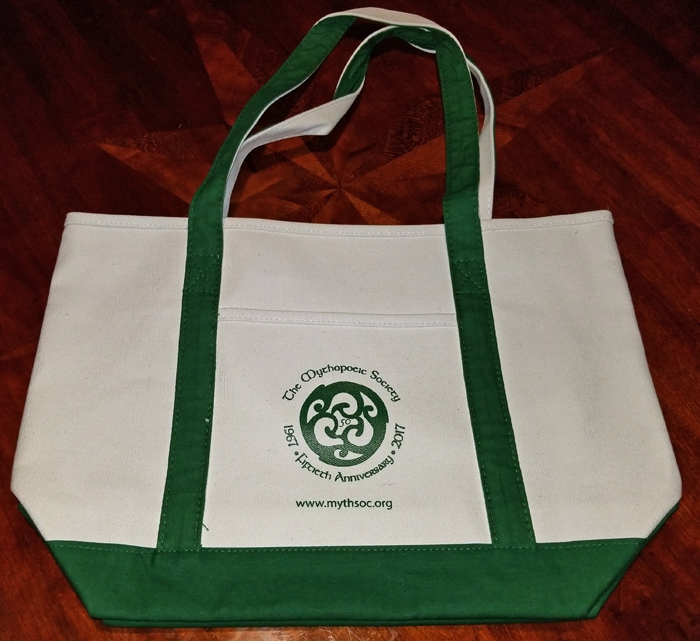 50th Anniversary MythSoc tote: $25.00 plus shipping. Mythcon 37 was held in Oklahoma; the theme was The Land and The Territory. Oklahoma is also the home state of Will Rogers, who famously said, "I never met a hobbit I didn't like" (...I'm sure that's right). 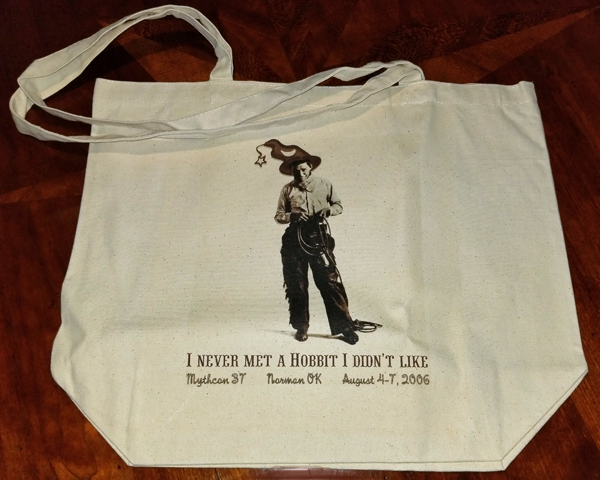 This tote bag features the conference logo on one side and an image of that old wizard Will Rogers on the other. It measures 18" wide, 14" tall, gusset at bottom about 5" deep. Standard weight canvas. 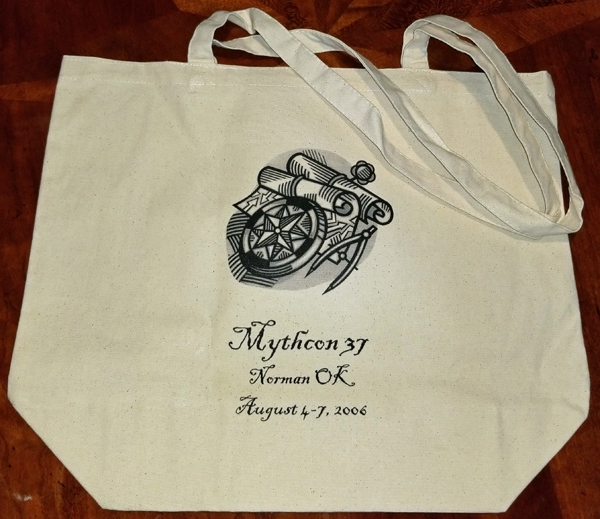 Mythcon 37 two-sided canvas tote: $20.00 plus shipping. 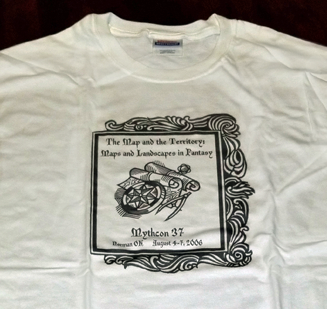 The Mythcon 37 T-shirt features the conference "Map and the Territory" logo. Only available in Medium and Large sizes: $12.00 plus shipping. 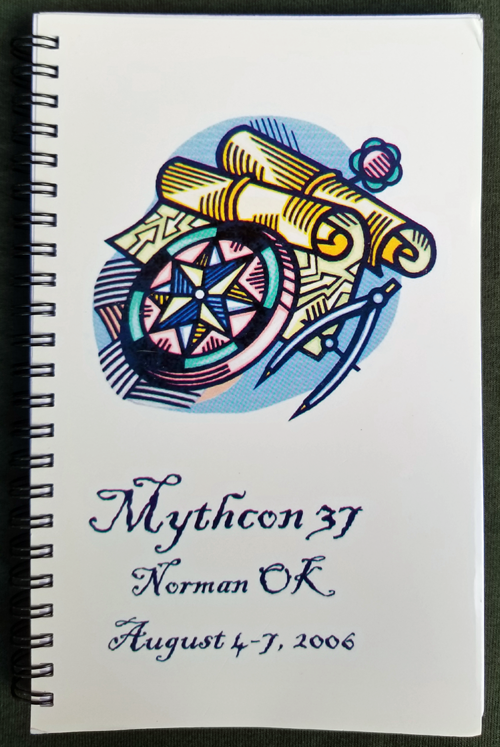 Mythcon 37 produced these very cool notebooks, approximately 8.5 x 5 inches, ruled paper. $10.00 plus shipping. Mythcon 37 conference logo buttons; $0.50 each plus shipping.